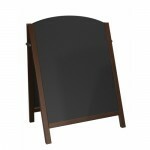 Timber framed, dark oak A Board with slide in chalkboard panels. These panels can be reversed giving four separate writing surfaces. Vinyl cut or printed headers can be supplied. 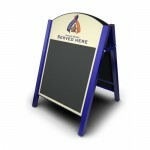 Available in two sizes and with a black steel frame as a slightly cheaper option. 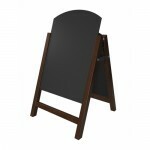 Timber Framed, Dark Oak ‘A’ Board with slide in chalkboard panels. 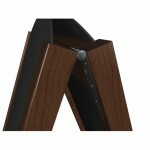 Or Black Steel Frame as a slightly cheaper option. These panels can be reversed, giving four separate writing surfaces. 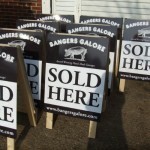 Vinyl cut or printed ‘Headers’ can be supplied.